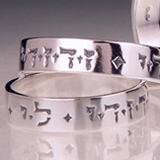 Beloved Rings ST002R "I am to My Beloved and My beloved is to me" Immortal words from Solomon's Song of Songs, engraved in an Italianate Hebrew script of the 17th century. 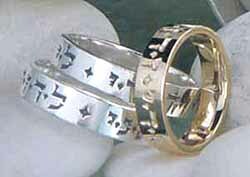 Available as a bracelet, adjustable cuff, and ring, in sterling silver, yellow or white gold, and platinum. Single size adjustable. 4.6 mm wide. 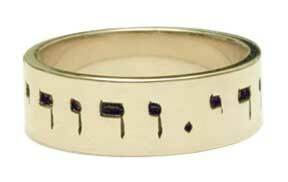 weight 4 - 5.95 grams depending on size. Bracelet Band width 5.9mm. Circumference 210mm. Diameter 67mm. 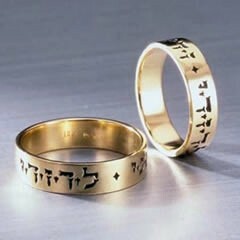 Custom made in Israel, not returnable unless damaged because it is custom. Revised: 23 Oct 2011 22:55:41 -0400 .